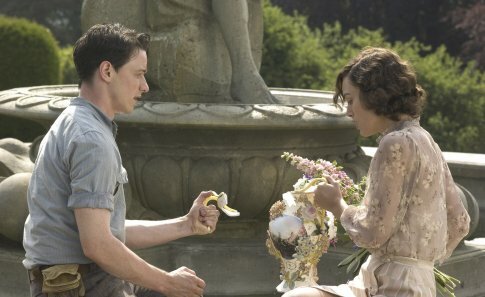 I said when I saw ATONEMENT at Toronto, that I would later discuss the ending, which had me completely broken. It did it again when I saw it on the opening day of its commercial release last month. Back in September, I partially wanted to finish up ASAP at a Toronto Internet cafe at 3am, and I partially wanted to recommend the movie as heartily as I could without spoiling it for others, since I went in completely tabula-rasa myself and think that a key to why this film hasn’t left my memory in months. At the end of the second act, Briony is told what she has to do to atone for her lies that put Robbie in jail and then later on the front lines and that estranged Cecilia from their family. The film flashes forward 50 years, from Briony sitting alone on a train to Briony as a famous elderly novelist. And we learn the truth that turns the movie inside out — everything we’ve been watching is a novel written by Briony, who is now giving a TV interview on it. The reunion that Robbie and Cecilia had that we see, and the promise of the reversal and clearing of Robbie’s name that was promised in that novel’s third act — it didn’t occur in “real life” and couldn’t have because they were both killed in the war (Robbie at Dunkirk, Cecilia in the Blitz). The movie closes on what we assume is the close of Briony’s novel, of Robbie and Cecilia in a beachfront cottage with a view of the White Cliffs of Dover. (I wonder if Americans realize how archetypal that is to a Briton, particularly in a World War II context.) “I gave them in fiction the happy ending they couldn’t have in life. That’s my atonement. It was all I could do,” Briony says (more or less) of what will be her last novel as she will soon slip into irreversible dementia. So this is the latest “twist” movie, though because ATONEMENT is not a crime or heist movie, I was completely, utterly unprepared for it. It’s a fairly common trick, in fact — the “unreliable narrator” — but it’s made effective by the fact that we don’t even really realize that the film actually HAS a narrator, much less that it’s a character within the story. But this is not an unfair trick, because, on reflection and second viewing, we see that some details of ATONEMENT’s style actually had set up the-film-to-that-point as discourse. It’s not just Briony is shown in the first act to be a precocious writer and in the second act to be writing a novel hinted to be about the first act. It’s also that the first things we see are a typewriter and typing (shades of another of my favorite recent movies, THE END OF THE AFFAIR, which also turns inside out upon the discovery of discourse). And the first things we hear are the familiar clackety-clack of a manual typewriter — a sound that never entirely leaves us because (it seems) scorer Dario Marianelli uses typewriter sounds on the score continuously. It made for a bracing score but, unbeknownest to the inattentive viewer, it also signifies that we are seeing something being typed, i.e., Briony’s novel. There are also details like a shattered vase that can’t be unbroken and a … well … randy note that can’t be unwritten that tell us that the film is going in significant part going to be about things irreversible, despite our best efforts, like Briony leaving Cambridge to work as a nurse and the implication that she’s writing about the girlhood events of the first act. In other words, ATONEMENT’s twist isn’t made-up or left-field, but the recoding of details that turn out to mean more or something different than they seemed at the time to — i.e., exactly Briony’s actions in the first act. There’s no way to do justice to my reaction to seeing Vanessa Redgrave as the elderly Briony. First, there was the absolute shock. I hadn’t seen her in a new movie in years (though she has been working) and her name on the credits had ducked or slipped out of my attention. Second, it was perfect casting. Not only is Redgrave one of the greatest actresses alive, but she is good physical resemblance for an elderly Romola Garai. Third, there are Redgrave’s physical qualities: her face — open, honest, virtually devoid of makeup, confident in itself; her voice — frank, well-spoken, uncluttered and (again) completely confident in itself. She looks and speaks (that perfect BBC Standard accent) like somebody who once had Briony’s haughtiness (well enacted by Saoirse Ronan) but has grown out of it. In just a few moments, Redgrave exudes pure, honest conviction without being showy or mannered, secure enough (finally) to present the most painful wisdom she ever gained. Then there’s Joe Wright’s direction of the scene, or rather the lack of it, which is such a contrast to Wright’s usual track-it-till-it-bleeds style. The score is silent, i.e., what we are seeing is not discourse. Most of it is closeups or shoulder or waist shots of a sitting Redgrave against a mostly- or entirely-black background — as elemental as the darkened confessional that it is, which is why Redgrave’s simple, unadorned assurance is so gripping. We are seeing inside Briony’s soul as she asks herself whether by creating a fictional happiness for Robbie and Cecilia, she has atoned for her crime. The very conventional happy ending shots and the romantically-swelling music close the film. What follows depends on how you react to those closing images. If you find them inspirational or cathartic (or a failed attempt therein), I think you have missed the point in search of a much less interesting movie. I found the last shot of ATONEMENT absolutely devastating, almost precisely in its falseness and facileness. Yes, we see Robbie and Cecilia happy, but we now *know* — stipulating the movie’s whole fictional universe as “real” — that they aren’t and Briany has not atoned for anything. Not really. Robbie and Cecilia are still dead because of her. In fact, she’s done something that, however well-intentioned (and the tragedy is that what she says is true — this is all that’s left to her), it can really, ultimately only be about herself and how good she feels. If you see forgiveness and/or atonement as a psychological state one bestows upon himself, you might be prepared to accept the apparent uplift at face value. But if you’re not and see atonement and/or forgiveness as real things, as real as Kris Kelvin wants his wife to be, you have a tragic tale of delusion, told through multi-layered discourses, including ultimately the delusion of (artistic) discourse itself. A happy ending is only happy if it is true; a false happy ending (which is what the film ATONEMENT gives us) is heart-rending. Self-atonement can be only, once you think about it, a form of psychological masturbation because there is no Other, no Higher to appeal to or forgive; the author may be the god of his novel (or film) but he is one without a heaven or hell. Mike D’Angelo (who, as I noted in the previous graf, didn’t care for ATONEMENT) made a similar point about the end of LIFE IS BEAUTIFUL, that it’s another movie about a character deluding himself so deeply that he invents a fictional world, and one that ends in a shot of conventional uplift which evaporates the minute you think about it (“mmm, Josue … I hate to break it to you, but Dad is dead, and about that tank …”; “mmm, Briony … I hate to break it to you, but Robbie and Cecilia, the real actual persons you wronged, are still dead”). And what’s stunning is that Mike realizes exactly what makes the similar ending of ATONEMENT great … that it’s “cathartic only for the character” (at best) but counts it as a flaw. Well, no it isn’t and frankly, I couldn’t have pegged ATONEMENT better myself — a “post-modern tragedy,” one where the protagonist’s “hamartia” is precisely her attempt to narrativize a set of experiences she only half-understands, which she then spends the rest of her life attempting to narrativize it “right,” and which the audience views through layers of representation. As to whether “post-modern tragedy” is a contradiction in terms — well, I would say ATONEMENT proves it isn’t.² Post-modern tragedy obviously differs from Greek tragedy (as does Roman and Shakespearean), but as long as human souls exist and the world is imperfect (and postmodernism can’t in principle erase either of those facts), tragedy will have a place. Mr Wright, like Mr McEwan before him, asks us to take fantasy as a consolation or apology for the unbearable poignancy of the story he has to tell. To me that is the reverse of a consolation. Instead, it makes a mockery of the artist’s own creation by treating it only as an excuse for a demonstration of his compassion and other fine feelings. That presupposes that the ending of the movie is a happy one. Indeed, Bowman even recognized in his review that “the title, Atonement, is therefore ironic. Real atonement for her sin was impossible.” Exactly. I suppose I can imagine a deeply unreflective person thinking the ending of ATONEMENT is meant to be happy. But how can someone who also realizes that the very title is ironic be such a person, not realize that the ending is a tragic heart-breaker and so the irony goes all the way down. It’s not a contradiction in the movie or a “mockery of the artist’s own creation,” but the movie’s very subject that art doesn’t atone. ¹ I’d also love to see NO COUNTRY FOR OLD MEN win, and not at all mind seeing JUNO or THERE WILL BE BLOOD win. And while the Coens and the Reitman look like locks for a nomination (less so the PTA), I would bet against their winning. ² Not that Bowman does this, but few things make as embarrassed to be a rightist than to read some of the sneering categorical putdowns of post-modernism by conservatives who plainly are ignorant of it. I agree! Mark and I just finished watching and i’m a little devastated! Thank you! The first time I saw Atonement, I found it moving but forgot it once the other big Oscar hits came out (this was the year of There Will Be Blood and No Country For Old Men). A few years later, I read the book then revisited the film and was blown away. Typically, I prefer a film to take a more ‘interpretation’ over ‘translation’ from page to screen, but the fact that the film is SO close to the book works because Wright uses cinema to truly bring it to life. The way the cinematography adjusts between ‘chapters’ makes perfect sense once you know the ending, because the film style corresponds entirely to Briony, whether it’s her as a girl or her more fanciful and romantic retellings. To me, this is an incredibly underrated film and one of the best literary adaptations of recent years. Excellent article.